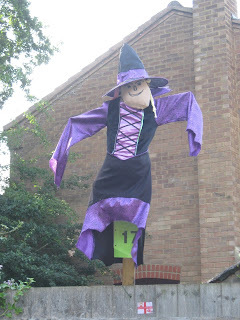 Sadly, one of our competitors had not realised that the scarecrows needed to be on display by the afternoon of Friday 3rd July, in order to participate in the judging. They put her on display once they came home from work, but it was too late for the magic to work for this particular scarecrow. Still, it was possible to award her a 'Well Done' rosette in time for the trail's opening on Saturday 4th July, so she did not miss out altogether on the honours. Thank You, to these competitors, for taking part in our trail for the very first time.